Andy Clarke is the president of the League of American Bicyclists. This article originally appeared on the League’s blog. On Tuesday, August 27th the U.S. Department of Transportation released a draft strategic plan for public comment. The 94-page document lays out how the U.S. Department of Transportation proposes to manage our transportation system for the next five years — guiding the work of some 57,000 federal employees and heavily influencing some $205 billion of annual spending on highways in this country. Cars and trucks are responsible for 83 percent of transportation-related greenhouse gas emissions, which are 27 percent of total U.S. greenhouse gas emissions. U.S. greenhouse gas emissions have increased 21 percent since 1990 — 60 percent of that increase is due to transportation. That all certainly points to the need for a new direction in transportation –- these problems are huge, the costs are staggering, and we’ve got $205 billion annually to spend on highways alone to do something about these problems. Alas, that’s not what “Transportation for a New Generation” offers. Not at all. To be fair, there are some hopeful numbers in the plan. So maybe a strategic plan that focuses on reducing vehicle miles traveled (VMT), creating more compact, walkable communities, and increasing the share of short trips made by foot or bike might be a good idea for all kinds of reasons? Apparently not. Instead, U.S. DOT has offered up a frighteningly complacent and vision-less strategic plan for the next five years. There are no real targets or performance measures that challenge the status quo or do anything to address the chronic safety, performance, environmental and equity issues that are so deeply embedded in our “transportation” agencies and their programs. Safety is the number one goal of the agency -– “Our top priority is to make the US transportation system the safest in the world” –- and yet no mention is made of how the United States compares to other countries. Spoiler alert: We’re tumbling down the international league table. There are 18 broad safety strategies over two pages and the word “speed” doesn’t appear once. The primary U.S. DOT commitment to reducing bicyclist and pedestrian fatalities and injuries is: “Encourage states to adopt policies and programs that improve pedestrian and bicyclist safety.” Seriously, it says that. The lack of a specific safety target -– “towards zero deaths” for example, or “vision zero” -– is striking. The only performance measure offered uses crashes per hundred million miles of vehicle travel as the metric. For years, the seemingly inexorable rise in vehicle miles traveled masked any real progress in reducing crashes and enables U.S. DOT to say to this day “we have made good progress” in improving traffic safety. Obviously that’s pretty useless for measuring bicyclist safety, and has been completely overshadowed by the fact that if you actually reduce VMT, even a tiny little bit, traffic crashes (and congestion) plummet. Remember, a 25 percent decline in traffic crashes matches up almost exactly with a 2 percent drop in VMT in the past five years. 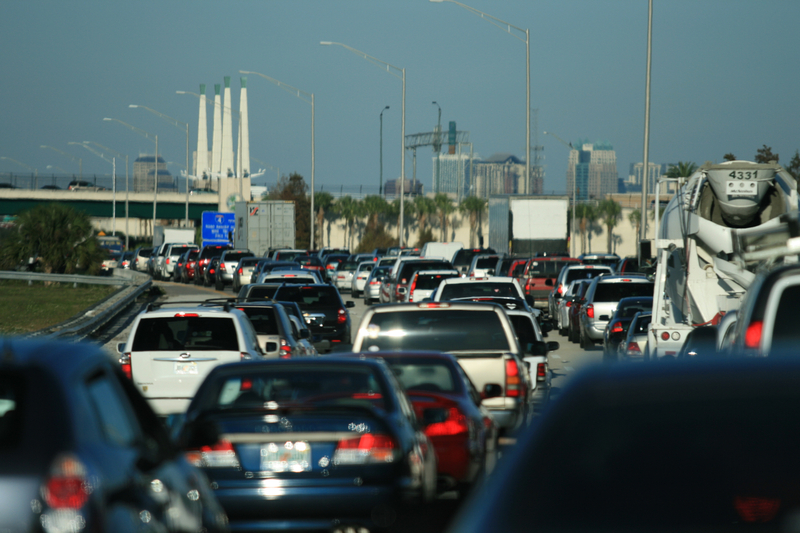 There’s no plan to reduce VMT. There are frequent references to budget constraints, rising costs, backlogs of investment, etc., etc. And yet in the very same paragraph the document says first that “all levels of government spent a combined $205 billion for highway-related purposes in 2010” and then “estimates of the total investment needed to address the remaining deficiencies in all existing highway and bridge assets ranges from $72.9 billion to $78.3 billion annually through 2030.” My math isn’t that great, but I think I can see a way to fix our highways and bridges, well before 2030. Economic competitiveness is focused heavily on freight issues and congestion. Yet there is no target to reduce VMT or increase other mode shares; there is no questioning whether the fact that 87 percent of passenger miles are traveled by cars and light trucks is a good thing or not. There’s a good section of the plan on Livable Communities with all the right language, but there’s no connection made between economic competitiveness or safety and livable communities. The idea of collaborating with housing and environmental protection agencies is excellent, but Federal Highways, Federal Transit, and NHTSA need to be working with a singular purpose as well. Health and physical activity is almost totally absent as an issue, which seems shocking in this day and age. Equity is mentioned in passing. The whole document seems intent on preserving a status quo that isn’t delivering for current generations, let alone new or future generations of Americans. I hear you ask: “Does a document like this really matter?” Well, yes. This strategic plan guides the annual workplans of each of the modal administrations in U.S. DOT. In turn, these generate the metrics, milestones and performance measures by which 57,000 employees are ultimately graded each year. Which is why, even with a window of just a few days, it’s important to get some comments in on this draft strategic plan. There are two ways to make comments. One is to participate in the online dialogue . There are already some suggestions on the site recommending a performance goal — toward zero deaths, complete streets, and more emphasis on non-motorized travel. You can either support those or write your own. Please take a moment to register a comment or two — and remember, as FHWA likes to say: Every day counts. Really, we’ve only got til September 10 to get those comments in. I wrote quite a while ago about the role young drivers (and young male drivers in particular) play in the decline of vehicle-related deaths over the past five years. I’m not convinced that a 2 percent decline in driving per age group would result in a 25 percent decline in roadway deaths overall. The decline in driving has been much more significant among young drivers, both those who have lost jobs and those who are just reaching driving age, and they’re far more likely to kill or be killed in their cars. As we saw with last year’s increase in roadway deaths, the improvement in the economy may result in a lot of younger drivers getting back on the road, and a continued uptick in deaths will likely accompany it. Wow, thanks for this. I wish I could attend every time-wasting planning meeting in San Francisco and just read those talking points aloud. I’m so sick of the car culture dominating the conversation all the time. We just ordered a Yuba elMundo–that’s a cargo bike with an electric assist. I really hope it’ll change our lives by saving us a ton of car trips. Mom with two young kids, here. Guess I should get to that letter writing to USDOT, eh? Our failure to rein this in is pretty absurd. It seems like not enough stakeholder input and environmental scanning was done for this plan. Hence the shortcomings. Why Are State DOTs So Afraid of Accountability?